It’s early morning; Mrinmay is taking his only goat, Munnu, for grazing. He walks for a few kilometers, ties the goat near a pasture and returns home. This goat has been the only investment his parents have been able to make. 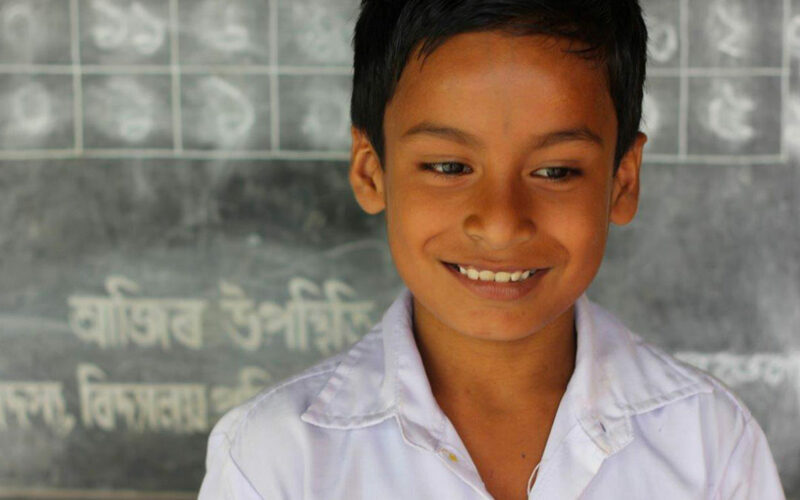 Mrinmay Malakar, as the school register indicates, is a grade 5 student at the Khudradadhi Lower Primary School, 12 kilometers from Guwahati, Assam. His father, the only earning member of the family, works as a labourer. To supplement the family income, he also doubles-up as a flower seller. The monthly income is volatile. During the few months when he is employed for most days, he is able to earn nearly Rs. 5,000 and rest of the year he earns about Rs. 2,000. This is just enough to meet the bare minimum family expenses. The mid-day meal served in the school is a relief for the family. At home it’s mostly rice, dal or pitha – a type of bread made of rice flour. Vegetables or lentils are not on the family’s menu every day. Mrinmay thus benefits from the wholesome nutritious meal given every school working day. He says "mid-day meals is very important." The ten-year-old loves the menu served on Saturday and Wednesday which is kheer, khichdi and vegetable pulao – a delicacy which is rarely cooked at home. According to the provincial census of 2011, only 33.4 % of the rural population and about 76.7 % of the urban population owned a television. However Mrinmay’s family belongs to the other half. Mrinmay thus spends his free time playing, "cricket or luka-paku" (the local name for hide and seek). He says, "In the evening, after bringing Munnu back home, I play. But many evenings I also help my father sell flowers." He thinks for a while, when he is asked what he wants to become when he grows up. The silence prompts his teacher to ask if he wants to become, "a police, a teacher, a doctor?" He nods his head to indicate that he doesn’t seem to like those choices. After a brief momentary silence, he says, "Professor." The teacher is ecstatic and claps for this little boy. The latest recipes, news and competitions sent straight to your inbox.